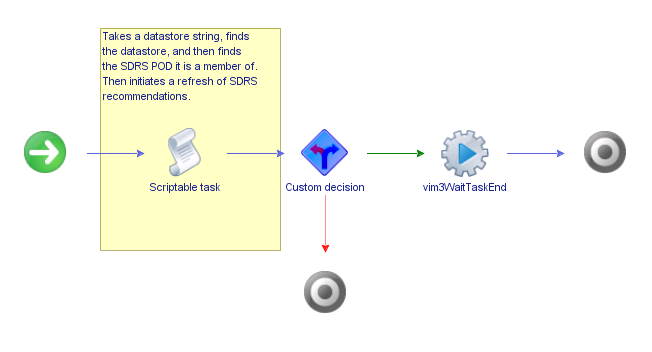 This workflow can be used as part of a self healing solution to ensure SDRS runs whenever you get a datastore alarm. (see Self Healing Datacenter). This ensures SDRS immediately runs and can balance the storage in the cluster. Takes the Datastore string passed to it and then searches vCenter for a Datastore Object matching the stringtext. This is stored as type VC:Datastore. Looks through all of the SDRS PODs declared in your general attributes to see if any of them contain the Datastore object found in step 1. If there is a match, it stores this as the variable “podToRunSDRSOn”, and stops searching. Run’s refresh recommendations on the pod “podToRunSDRSOn”. Only 1 scriptable task has been used above, and i’m considering making it an action item if I don’t expand on the workflow further. This entry was posted in Uncategorized by nickcolyer. Bookmark the permalink. I think your missing the imput of podsArray. Else please add how to get all PODs of a DC or Cluster.